You want to know about somebody, something, a place, a how, a when, whatever? Ask him and you will always have an answer. During his career, Aldo managed to combine philosophy and computer science and become one of the top computer scientist, able to go deep to the essence of any problem. 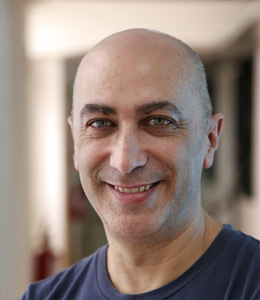 Aldo Gangemi is researcher at ISTC-CNR, Rome, and professor at University Paris 13 (Sorbonne Paris Cité, CNRS UMR 7030). He has founded and directed the Semantic Technology Lab (STLab) of ISTC-CNR since 2008 (he previously co-founded the Applied Ontology Lab of ISTC-CNR in Trento). His research focuses on Semantic Technologies as an integration of methods from Knowledge Engineering, the Semantic Web, Linked Data, Cognitive Science, and Natural Language Processing. His theoretical interests concentrate upon the representation and discovery of knowledge patterns across data, ontology, natural language, and cognition. Applications domains include Medicine, Law, eGovernment, Agriculture and Fishery, Business, and Cultural Heritage. He has published more than 200 papers  in international peer-reviewed journals, conferences and books, and seats as EB member of international journals (Semantic Web, Applied Ontology, Web Semantics), as conference chair (LREC2006, EKAW2008, WWW2015), and advisory committee member for international organizations. He has worked in the EU projects: Galen, WonderWeb, OntoWeb, Metokis, NeOn, BONy, IKS, and MARIO. Some of the software projects he contributed to (e.g. FRED, Aemoo, Semantic Scout, Sentilo, XDTools, etc.) in ontology engineering, knowledge extraction and exploratory search are demonstrated in web applications or services from . Reasoning with data flows and policy propagation rules, Daga E, Gangemi A, Motta E, In Semantic Web, volume 9, 2018. Amnestic Forgery: An Ontology of Conceptual Metaphors, Gangemi A, Alam M, Presutti V, In Formal Ontology in Information Systems - Proceedings of the 10th International Conference, FOIS 2018, Cape Town, South Africa, 19-21 September 2018, 2018. Linked Metaphors, Gangemi A, Alam M, Presutti V, In Proceedings of the ISWC 2018 Posters & Demonstrations, Industry and Blue Sky Ideas Tracks co-located with 17th International Semantic Web Conference (ISWC 2018), Monterey, USA, October 8th - to - 12th, 2018., 2018. Extending ScholarlyData with Research Impact Indicators, Nuzzolese AG, Presutti V, Gangemi A, Ciancarini P, In Semantics, Analytics, Visualization - 3rd International Workshop, SAVE-SD 2017, Perth, Australia, April 3, 2017, and 4th International Workshop, SAVE-SD 2018, Lyon, France, April 24, 2018, Revised Selected Papers, 2018. Amnestic Forgery: an Ontology of Conceptual Metaphors, Gangemi A, Alam M, Presutti V, In CoRR, volume abs/1805.12115, 2018. Extending ScholarlyData with Research Impact Indicators, Nuzzolese AG, Presutti V, Gangemi A, Ciancarini P, In PeerJ PrePrints, volume 5, 2018. Aemoo: Linked Data exploration based on Knowledge Patterns, Nuzzolese AG, Presutti V, Gangemi A, Peroni S, Ciancarini P, In Semantic Web, volume 8, 2017. The Publishing Workflow Ontology (PWO), Gangemi A, Peroni S, Shotton DM., Vitali F, In Semantic Web, volume 8, 2017. Semantic Web Machine Reading with FRED, Gangemi A, Presutti V, Recupero DR, Nuzzolese AG, Draicchio F, Mongiovì M, In Semantic Web, volume 8, 2017. Frame-Based Ontology Alignment, Asprino L, Presutti V, Gangemi A, Ciancarini P, In Proceedings of the Thirty-First AAAI Conference on Artificial Intelligence, February 4-9, 2017, San Francisco, California, USA., 2017. Understanding social networks within complex, nonlinear systems.